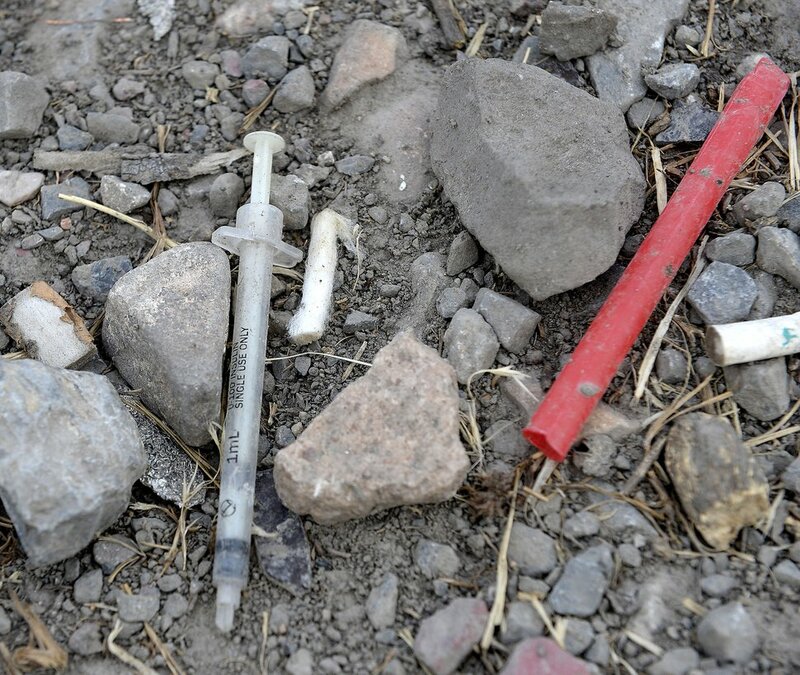 How Salt Lake City’s Rio Grande District Became Such A Drug-Fueled Wasteland, and why a fix is difficult. Al Hartmann | The Salt Lake Tribune Salt Lake City police officer Sgt. 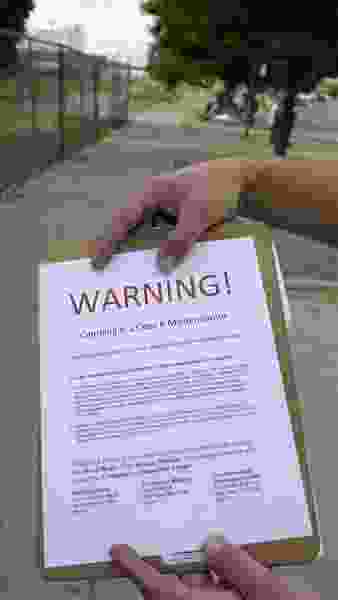 Sam Wolf holds a warning notice he will post in the Rio Grande neighborhood Wednesday morning July 19. Camping on the street is a class B misdemeanor and can now be enforced. 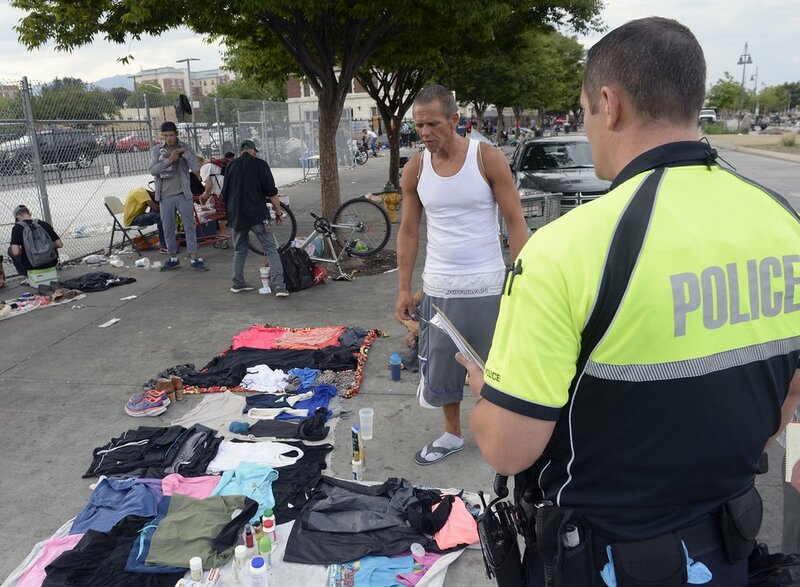 The area around Pioneer Park and Rio Grande Street's homeless shelter has long been a place to score illegal drugs. Crack cocaine, methamphetamine and alcohol were the substances of choice until about 2013 or '14. Then heroin swept in and amped up everything. It's no longer a drug deal here and there. Now, drugs are passing hands nonstop, 24/7. 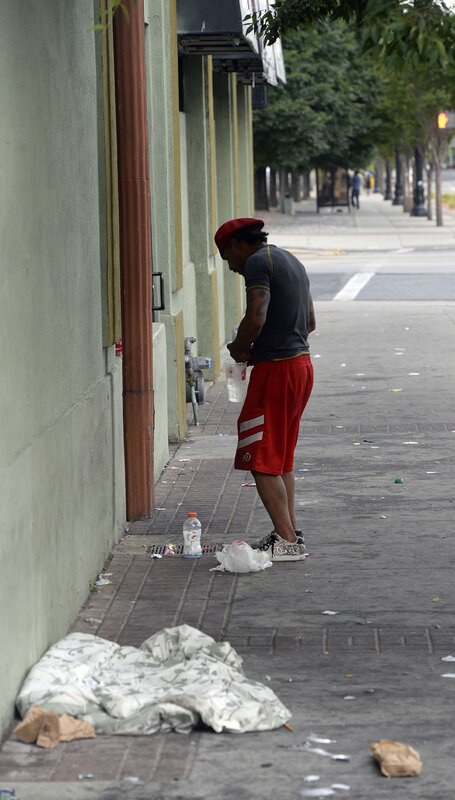 It is not uncommon to see addicts shooting up in broad daylight. "These people have hit rock bottom," he said. "They have nothing left." Folks down on their luck looking for a roof have gathered on Rio Grande Street in Salt Lake City's downtown for more than three decades. 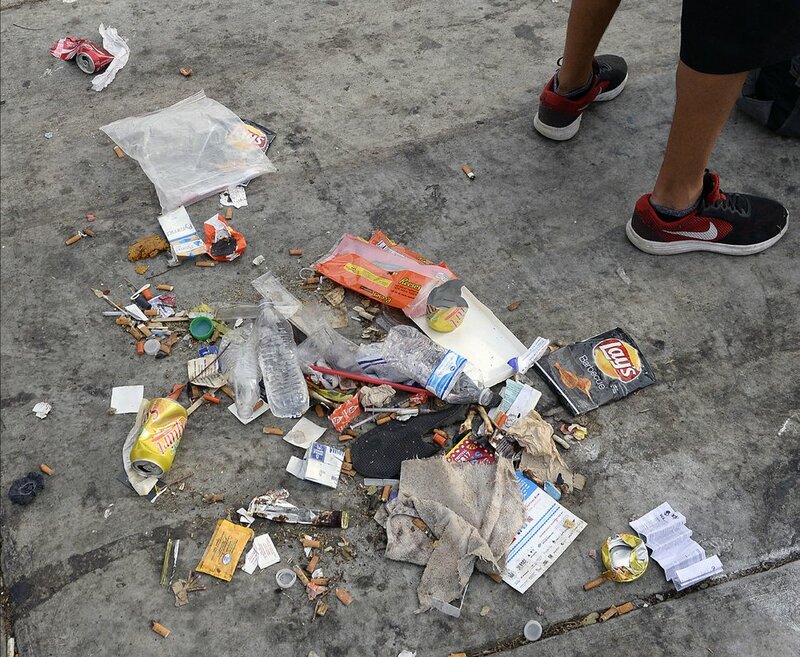 But only in recent years has it become a nasty hub of drug dealers and addicts who pose a danger to shelter clients and passers-by — shootings in the shadows from drug deals gone bad, nighttime bludgeonings over turf and people overdosing on hot sidewalks under the bright sun. During the past four years, the opioid epidemic, fueled by prescription drugs that lead many to heroin, has surged into the area, as it has in many locales across the country. 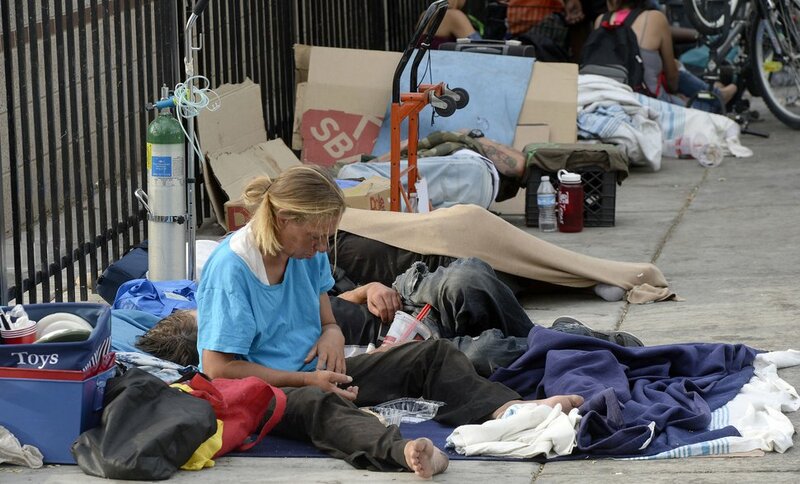 It has upended decades of work by local, state and federal agencies, as well as a multitude of private entities, seeking to help the state's homeless population. "The long-term plans are great," she said, referring to three proposed new homeless shelters/resource centers and programs that won't open their doors for at least two years. "But we need immediate action down there. 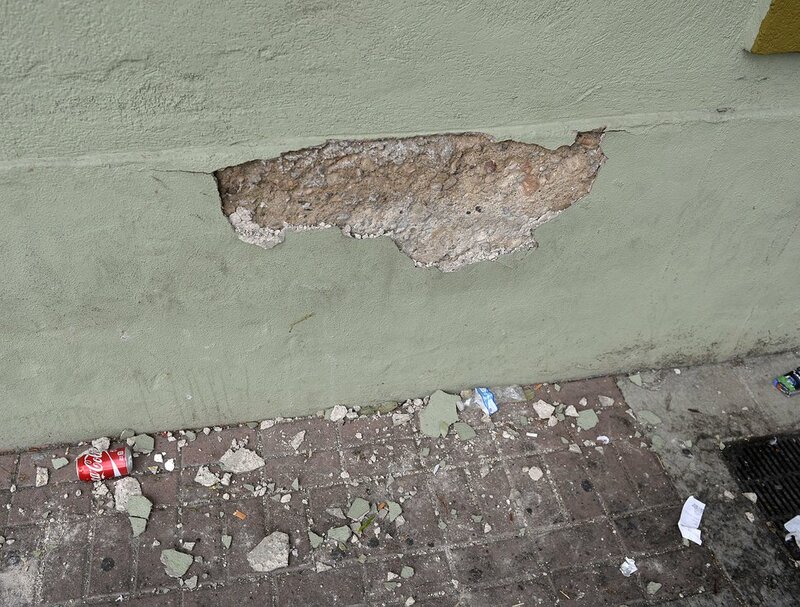 We need an action plan to come up with ways to keep drug dealers from using the area." "Some people have told me, 'I like being on drugs. Leave me alone,' " Atkinson said. "There is a certain group who say they aren't going anywhere and that group is growing." The law and the lawlessness • On Wednesday, Gov. Gary Herbert announced a new plan would be implemented to curb the chaos and lawlessness there. Details remain sketchy, but the governor said the state is ready to spend more money for cops. 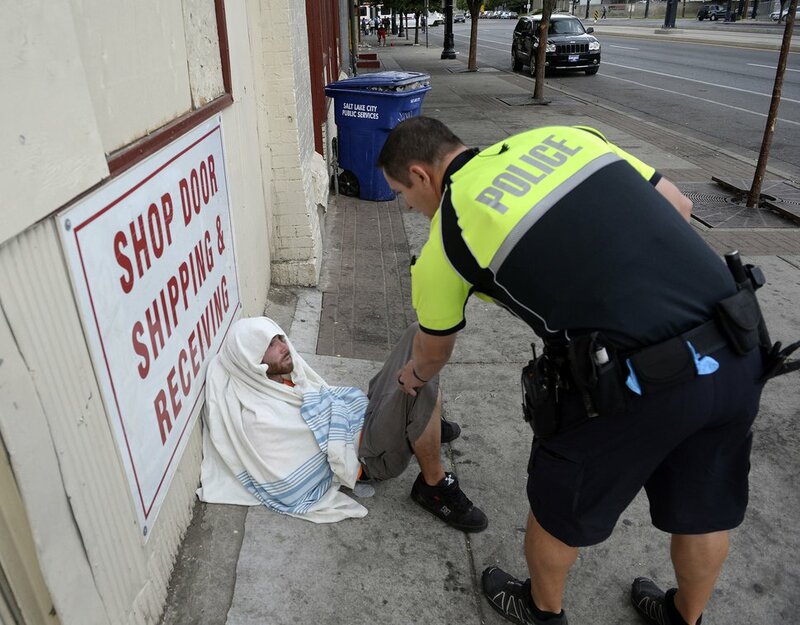 In a previous interview, Salt Lake City Police Chief Mike Brown emphasized that "homeless people aren't driving the drug trade. They don't have the money." 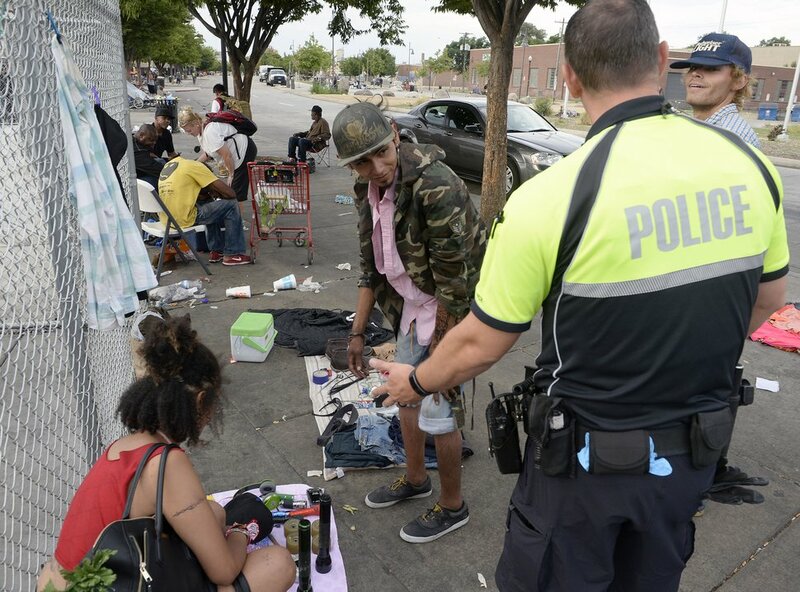 He said Utahns who aren't homeless, as well as people from as far away as Wyoming and Idaho, come to score drugs in the Rio Grande area, particularly along 500 West. "They prostitute themselves for a little bit of dope," Wolf said. "It takes a mental toll on them. They've made that choice, and it tears them up emotionally." Others who experiment with drugs recreationally fall prey to heroin with similar results, according to law enforcement. And some who weren't drug users, but found themselves at the shelter, take up drugs to alleviate the stress of their predicament and become addicted. 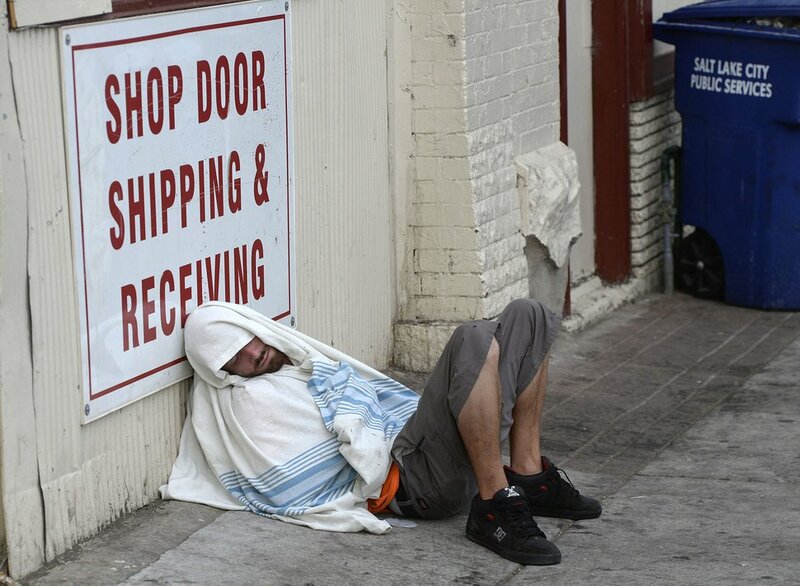 Either way, homeless addicts find it difficult to get off the street. Although the United States comprises 5 percent of the world's population, it accounts for 80 percent of global opioid consumption, according to The Washington Post. "The medical community is as culpable as anyone," he said, "including the drug cartels." To jail or not to jail? • In June, former Salt Lake County Sheriff Jim Winder withdrew a year-old jail restriction that barred booking misdemeanor suspects. Winder withdrew the year-old restrictions grudgingly. He says society cannot arrest its way out of drug addiction. "They go back to the same environment that fundamentally hasn't changed," he said of drug users after they are released from jail. "The premise that the Rio Grande area is a location to provide help is a myth." "Salt Lake City has become the absolute parent with the 40-year-old kid living in the basement," he said. "A community gets exactly what it tolerates." 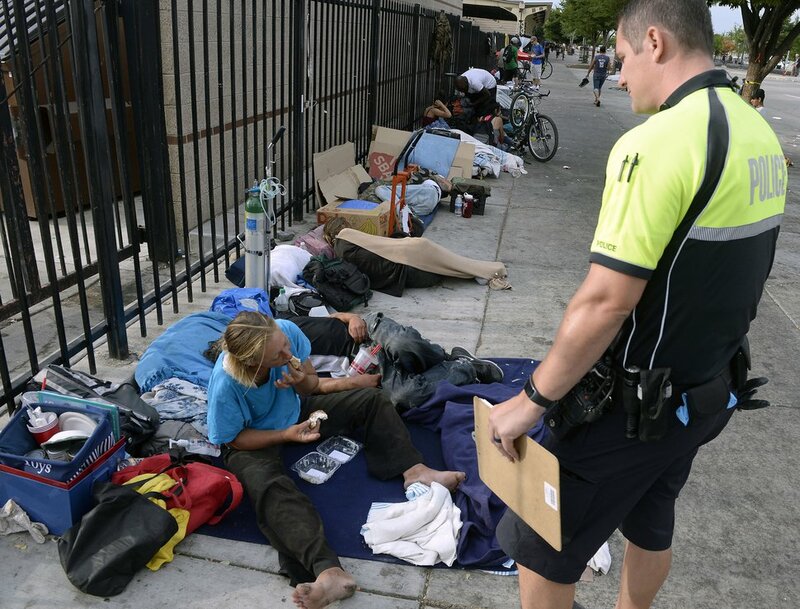 By contrast, Brown, Salt Lake City's police chief, said the community must treat the homeless with dignity, no matter whether they are addicted or mentally ill, though he maintains it is important for officers to be able to arrest people who are openly using drugs. It makes the environment better and gives jailed addicts a pause to reflect upon their circumstances. "When we arrest these folks," he said, "we need to get them into court and get them the treatment they need." During the past year, Salt Lake City and Salt Lake County teamed up in Operation Diversion: Law enforcement officials arrested people committing crimes, and then the district attorney's office offered them the option of treatment or jail. Of the 68 people "diverted" from jail beds to treatment beds in three sweeps, six had graduated and 54 had fled by mid-May. Two more homicides in the area on July 25 and 26 punctuated Hughes' call to action. There are solutions • Four years ago, at the onset of Rio Grande's epidemic, Mathis implored the City Council to ratchet up funding to address the climate there, which, he said, was deteriorating rapidly. Through a philosophy called "Housing First," addicts and those suffering from mental illness are placed in apartments in Salt Lake City in what is called "permanent supportive housing." Caseworkers direct them to various resources and treatment options and follow up on their progress. The philosophy holds that once people are stabilized, they can regain sobriety and mental health. There are about 2,000 such "permanent supportive housing" units in Salt Lake County. Not only has Housing First been pushed to the back burner, but folks seeking treatment for addiction or mental health issues find a dearth of inpatient treatment centers. That is due partly to the way the state responded to the Affordable Care Act's expansion of Medicaid. State leaders didn't want to accept the broader Obamacare program and instead sought a limited waiver. They've been unsuccessful, losing out on tens of millions of dollars to treat addiction and mental illness. Such funding could be critical as Salt Lake City and the county move to the scattered-site model for three new resource centers. The planned emergency shelters that would coordinate services for clients are expected to house a total of about 600 people — 500 less than The Road Home can now accommodate. The proposed system, however, is not designed for homeless people who are addicts or who need mental health therapy. 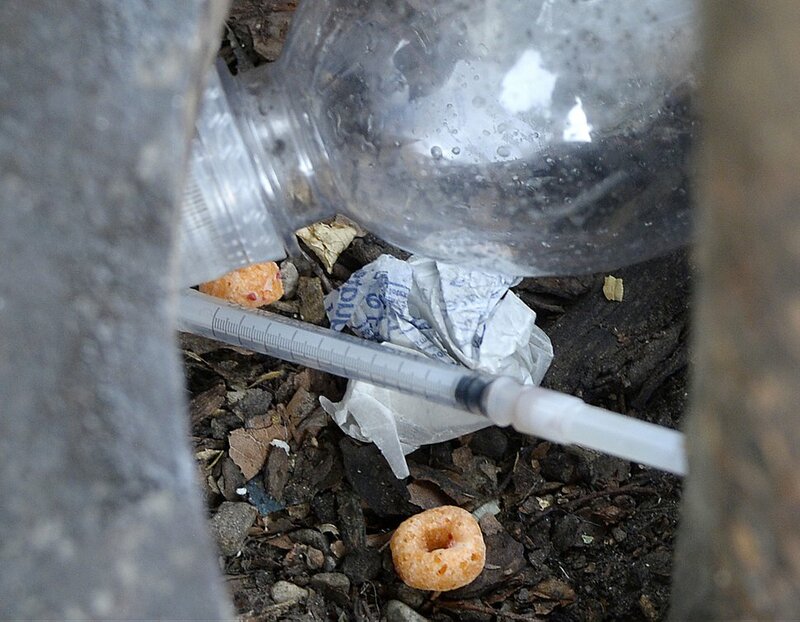 Al Hartmann | The Salt Lake Tribune Hypodermic needle used for shoting heroin and cereal lodged in a tree well along 200 S. and 500 W. in Salt Lake City Wednesday July 19. 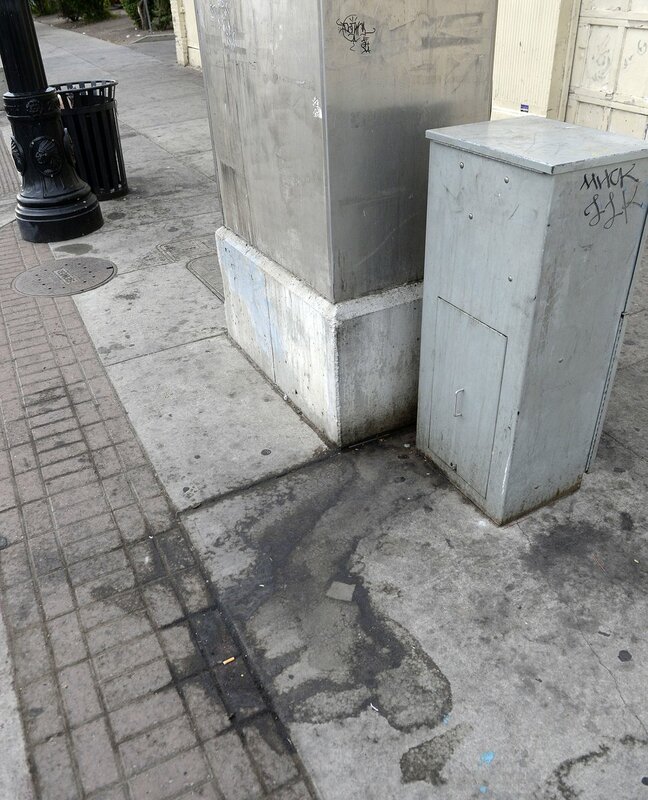 Al Hartmann | The Salt Lake Tribune Urine stains on the sidewalk near 200 S. and 550 W. in Salt Lake City Wednesday July 19. Al Hartmann | The Salt Lake Tribune Salt Lake City police officer Sgt. Sam Wolf wakes a sleeping man along 200 S. and 500 W. Wednesday morning July 19. 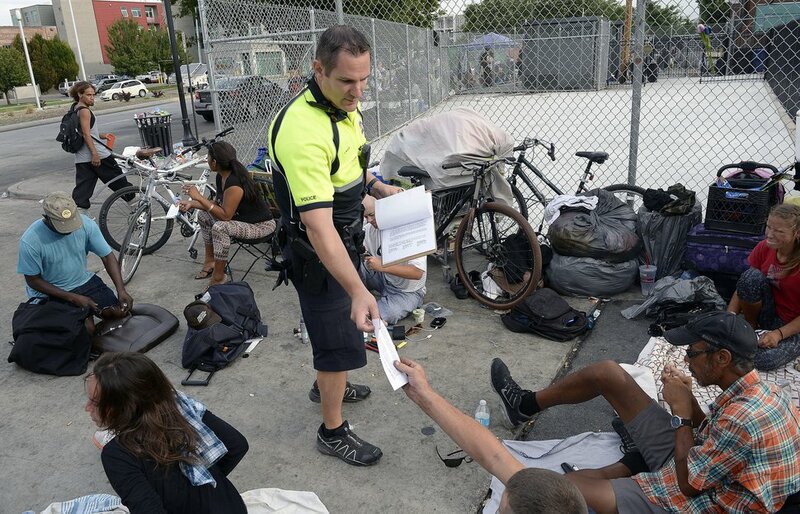 He politely wakes up dozens of homeless camped on the sidewalks, telling them that they have to break down their camps and offers advice for help and rescources. Camping on the street is a class B misdemeanor and can now be enforced. 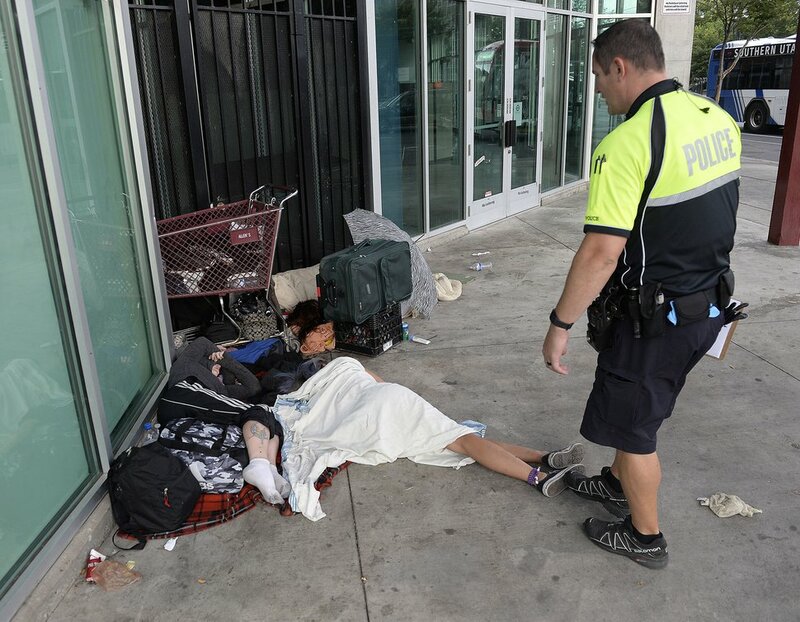 Al Hartmann | The Salt Lake Tribune Two homeless women sleep along 200 S. and 500 West in Salt Lake City Wednesday July 19. 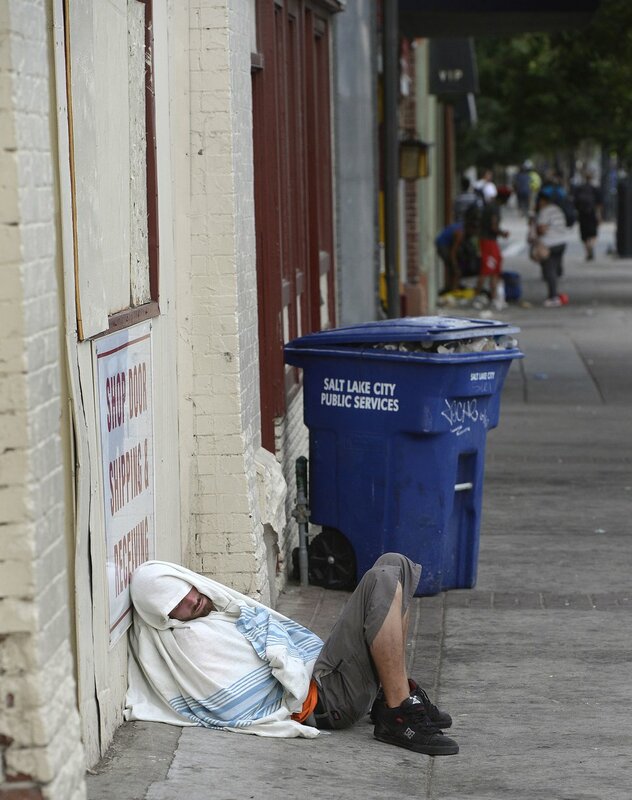 Al Hartmann | The Salt Lake Tribune Man sleeps on sidewalk near 200 S. and 500 W. Wednesday morning July 19. Al Hartmann | The Salt Lake Tribune Salt Lake City police officer Sgt. Sam Wolf nudges the foot of a sleeping homeless woman and her friend along 200 S. and 500 W. Wednesday morning July 19. He politely wakes up dozens of homeless camped on the sidewalks, telling them that they have to break down their camps and offers advice for help and rescources. Camping on the street is a class B misdemeanor and can now be enforced. Al Hartmann | The Salt Lake Tribune Sgt. 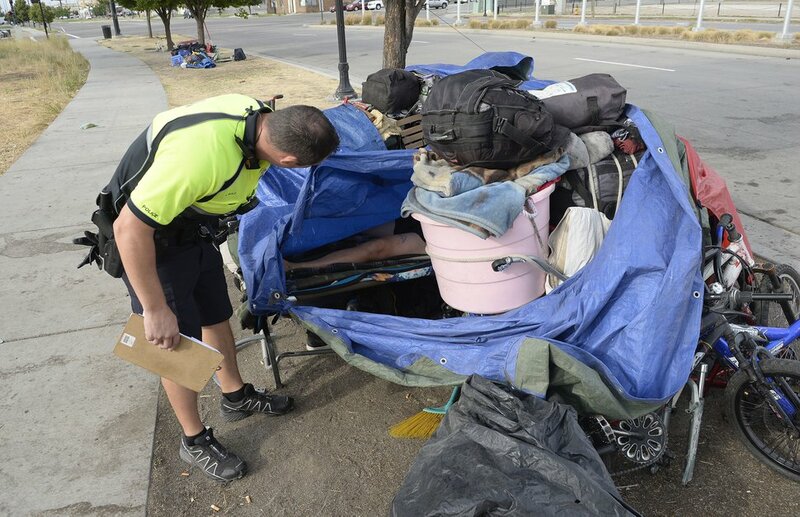 Sam Wolf leaves the SLCPD's Community Connection Center at 200 S. 500 W. early Wednesday morning July 19 to wake up homeless campers along the street, offer advice for help and explain that camping on the street is a class B misdemeanor and can now be enforced. Al Hartmann | The Salt Lake Tribune Salt Lake City bicycle patrol officers have an early morning briefing Wednesday July 19 at the Community Connection Center at 200 S. 500 W. before hitting the streets in the Rio Grande neighborhood. 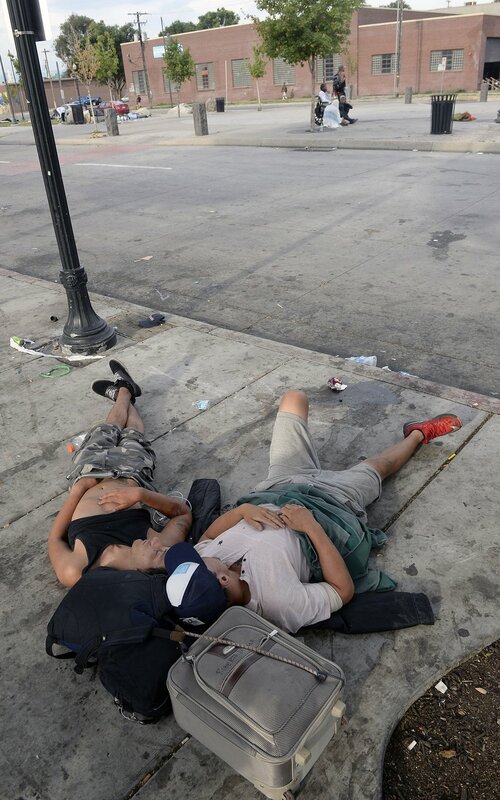 Al Hartmann | The Salt Lake Tribune People rest while some sleep on sidealk near 200 S. and 500 W. Wednesday morning July 19. Camping on the street is a class B misdemeanor and can now be enforced. Al Hartmann | The Salt Lake Tribune Salt Lake City police officer Sgt. Sam Wolf wakes a woman camped in a makeshift shelter along 200 S. and 500 W. Wednesday morning July 19. 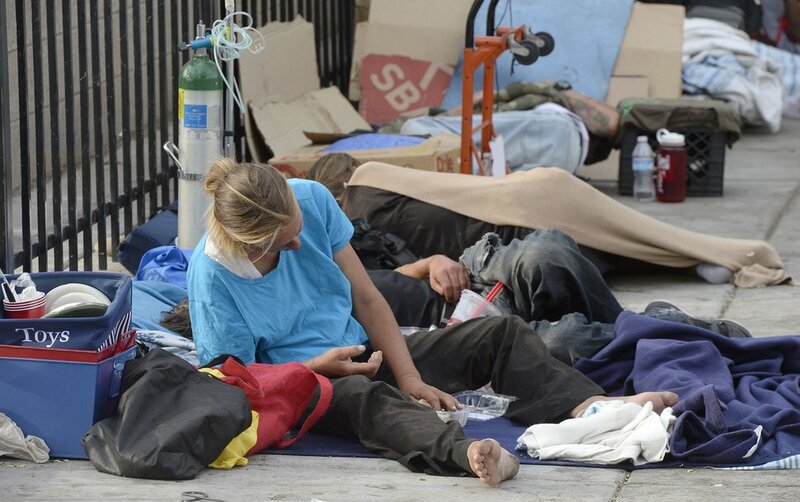 He politely wakes up dozens of homeless camped on the sidewalks, telling them that they have to break down their camps and offers advice for help and rescources. Camping on the street is a class B misdemeanor and can now be enforced. Al Hartmann | The Salt Lake Tribune Garbage on the sidewalk near 200 S. and 500 W. Wedesday July 19. Homeless people sleep and camp out there by the dozens. Al Hartmann | The Salt Lake Tribune Salt Lake City police officer Sgt. Sam Wolf wakes a group of sleeping people camped along 200 S. and 500 W. Wednesday morning July 19. He politely wakes up dozens of homeless camped on the sidewalks, telling them that they have to break down their camps and offers advice for help and rescources. Camping on the street is a class B misdemeanor and can now be enforced. 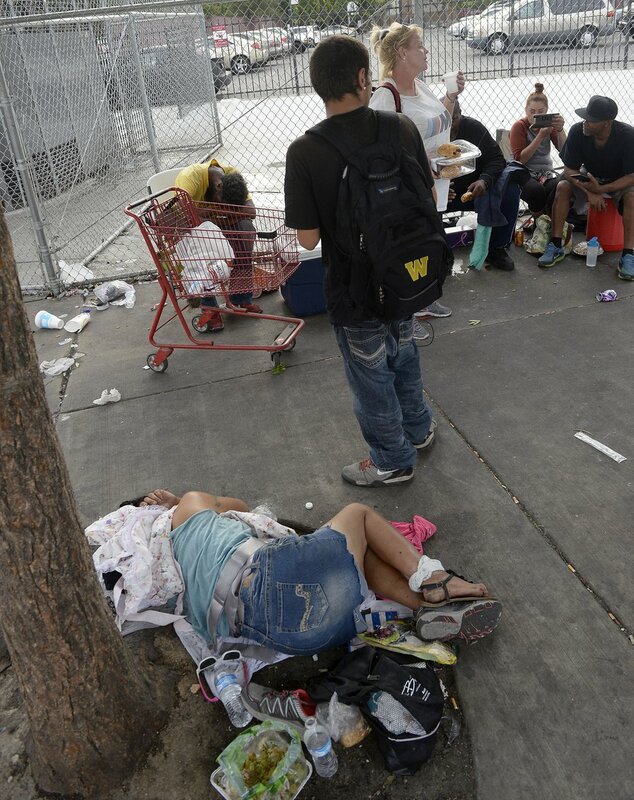 Al Hartmann | The Salt Lake Tribune People sleep on sidewalk near 200 S. and 500 W. Wednesday morning July 19. Camping on the street is a class B misdemeanor and can now be enforced. 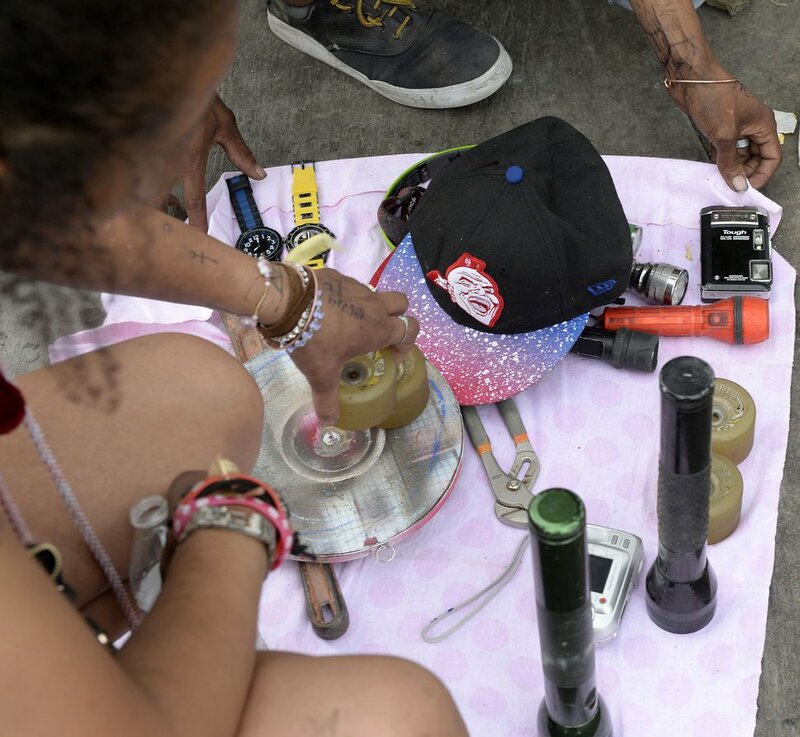 Al Hartmann | The Salt Lake Tribune Woman tries to sell items from flashlights to skateboard wheels along 200 S. and 500 W. Wednesday morning July 19. 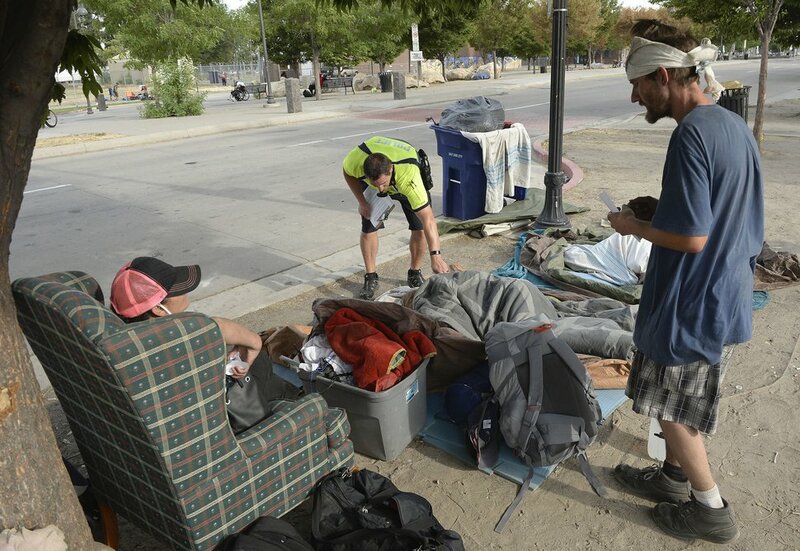 Al Hartmann | The Salt Lake Tribune People sleep on sidealk near 200 S. and 500 W. Wednesday morning July 19. Camping on the street is a class B misdemeanor and can now be enforced. Al Hartmann | The Salt Lake Tribune Sleeping woman curls up along 500 W. and 250 S. Wednesday morning July 19. Camping on the street is a class B misdemeanor and can now be enforced. Al Hartmann | The Salt Lake Tribune Salt Lake City police officer Sgt. 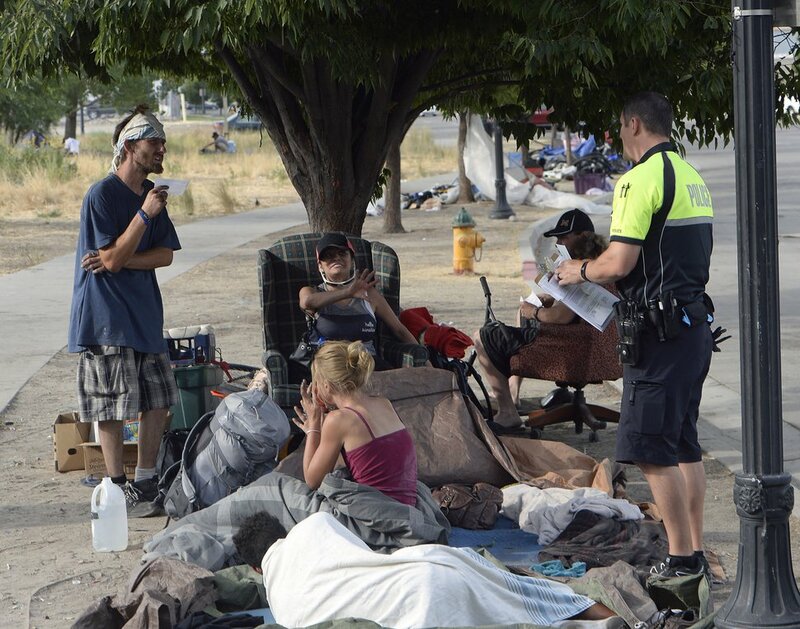 Sam Wolf talks to people near 200 S. and 500 W. Wednesday morning July 19 and gives them a note stating the city ordinance prohibiting camping on the street. He politely wakes up dozens of homeless camped on the sidewalks, telling them that they have to break down their camps and offers advice for help and rescources. Camping on the street is a class B misdemeanor and can now be enforced. Al Hartmann | The Salt Lake Tribune Salt Lake City police officer Sgt. Sam Wolf explains to people that they need a business license to sell items along 200 S. and 500 W. Wednesday morning July 19. Al Hartmann | The Salt Lake Tribune Salt Lake City police officer Sgt. Sam Wolf explains to a man that he needs a business license to sell items along 200 S. and 500 W. Wednesday morning July 19. Al Hartmann | The Salt Lake Tribune Man wakes up and picks up his belongings along 200 S. and 550 W. in Salt lake City Wednesday July 19. 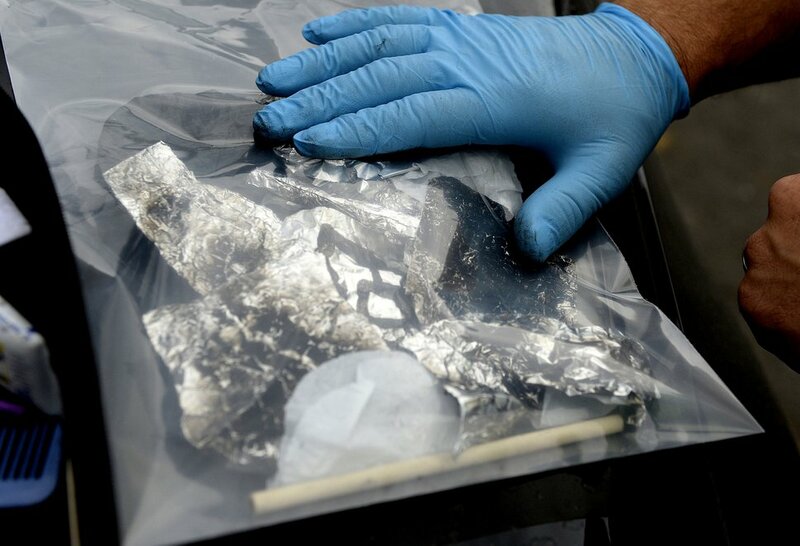 Al Hartmann | The Salt Lake Tribune Salt Lake City police officer bags up tinfoil used to inhale burning heroin after a drug bust in the Rio Grande neighborhood Wednesday July 19. 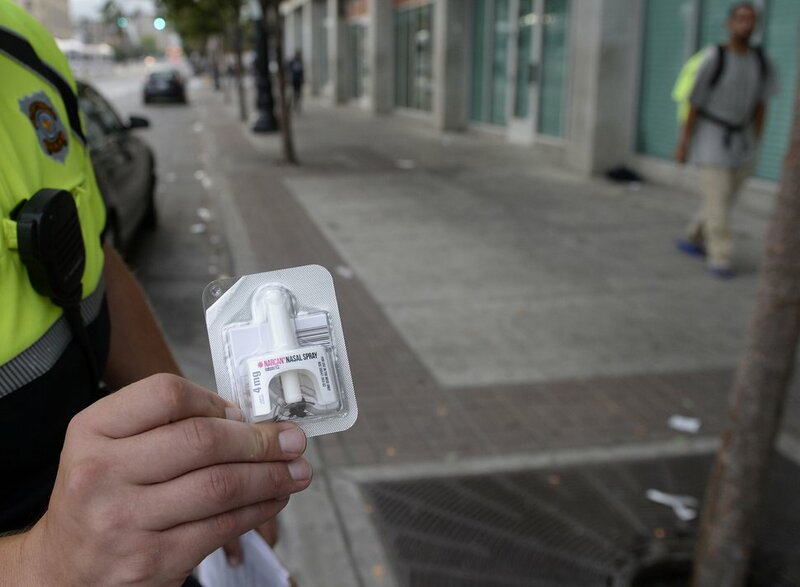 Al Hartmann | The Salt Lake Tribune Used hypodermic needle used to shoot heroin and a straw used to inhale burning heroin from tinfoil in the Rio Grande neighborhood Wednesday July 19. Al Hartmann | The Salt Lake Tribune Salt Lake City police officer Sgt. 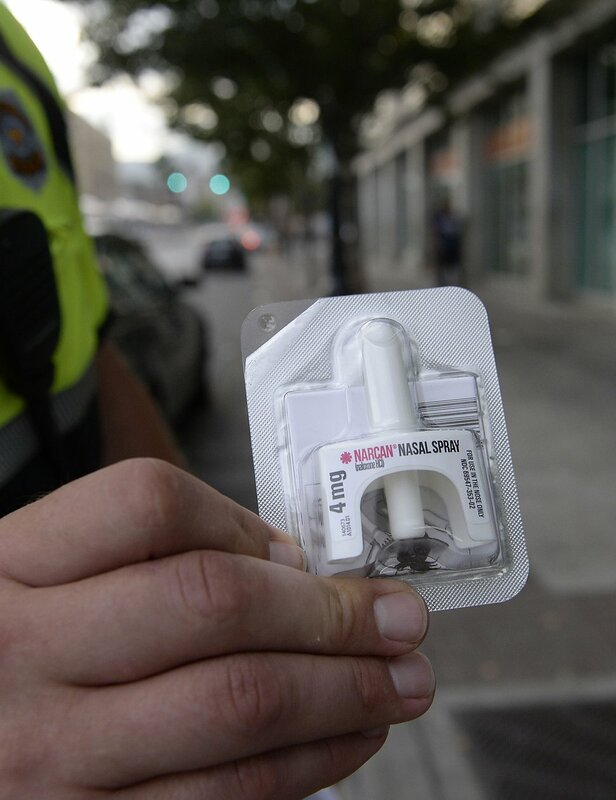 Sam Wolf who patrols the Rio Grande neighborhood holds a dose of Narcan nasal spray he carries to help revive heroin overdose vicitims. 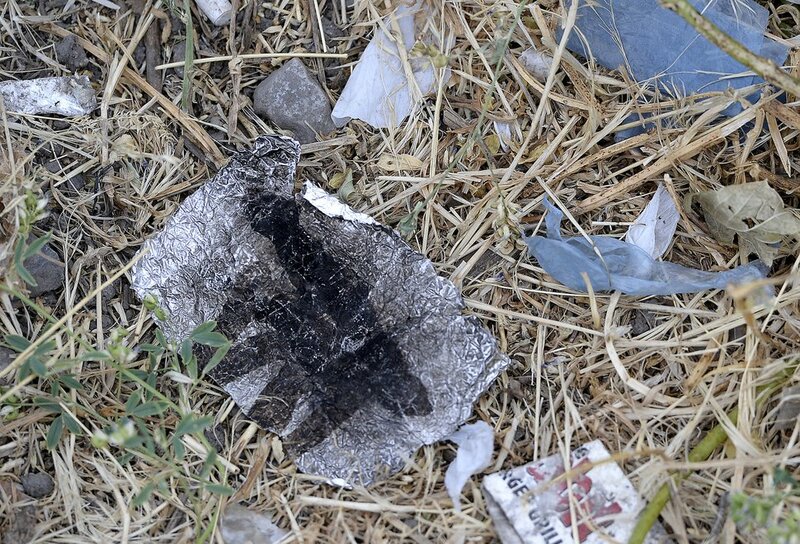 Al Hartmann | The Salt Lake Tribune Tinfoil used to inhale burning heroin in the Rio Grande neighborhood Wednesday July 19. Al Hartmann | The Salt Lake Tribune Poperty damage to storefront from homeless campers near 200 S. 550 W. in Salt Lake City. 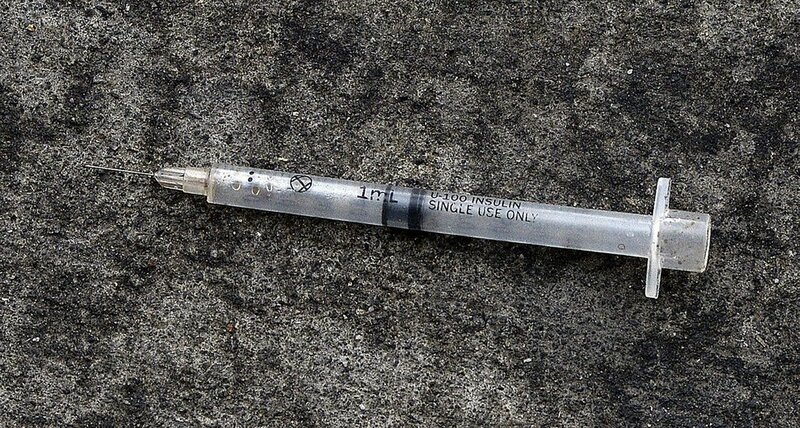 Al Hartmann | The Salt Lake Tribune Used hypodermic needle on sidewalk at 200 S. 550 W. in Salt Lake City Wednesday July 19. 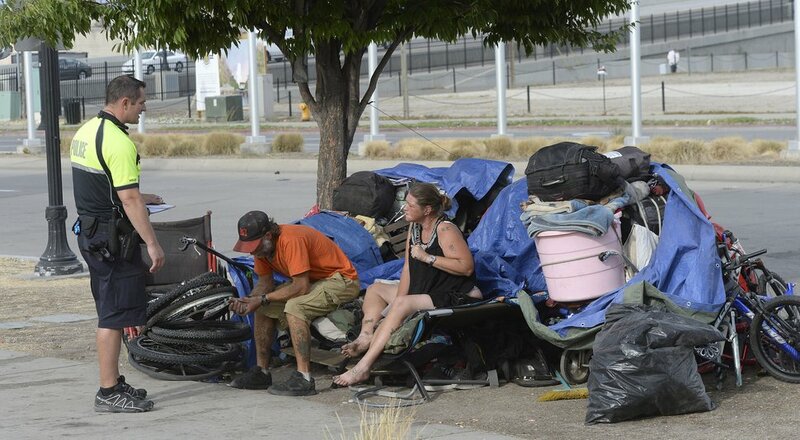 Al Hartmann | The Salt Lake Tribune People sleep on sidewalk with their belongings and makeshift shelters near 300 S. and 500 W. Wednesday morning July 19. Camping on the street is a class B misdemeanor and can now be enforced. 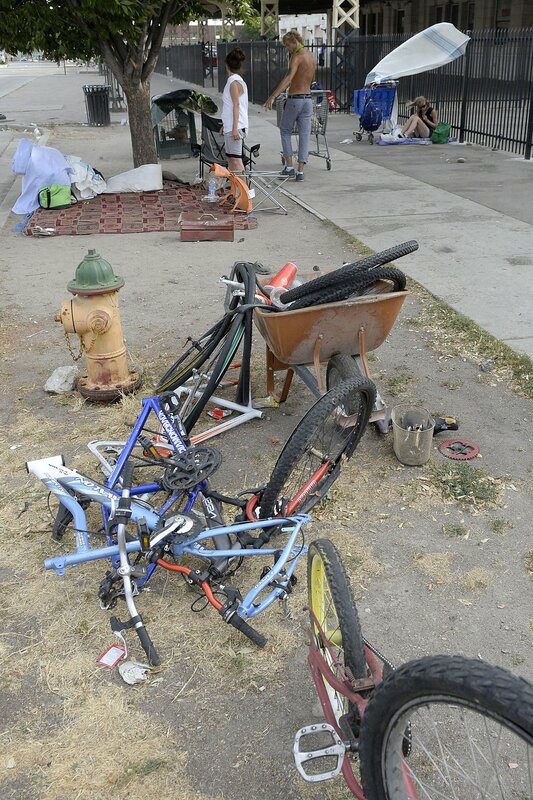 Al Hartmann | The Salt Lake Tribune People sleep on sidewalk with their belongings near 200 S. and 500 W. Wednesday morning July 19. Camping on the street is a class B misdemeanor and can now be enforced. Al Hartmann | The Salt Lake Tribune Salt Lake City police officer Sgt. Sam Wolf wakes a group of sleeping people camped near 200 S. and 500 W. Wednesday morning July 19. He politely wakes up dozens of homeless camped on the sidewalks, telling them that they have to break down their camps and offers advice for help and rescources. Camping on the street is a class B misdemeanor and can now be enforced. Al Hartmann | The Salt Lake Tribune Salt Lake City police officer Sgt. Sam Wolf wakes people camped near 200 S. and 500 W. Wednesday morning July 19. He politely wakes up dozens of homeless camped on the sidewalks, telling them that they have to break down their camps and offers advice for help and rescources. Camping on the street is a class B misdemeanor and can now be enforced. Al Hartmann | The Salt Lake Tribune Salt Lake City police officer Sgt. 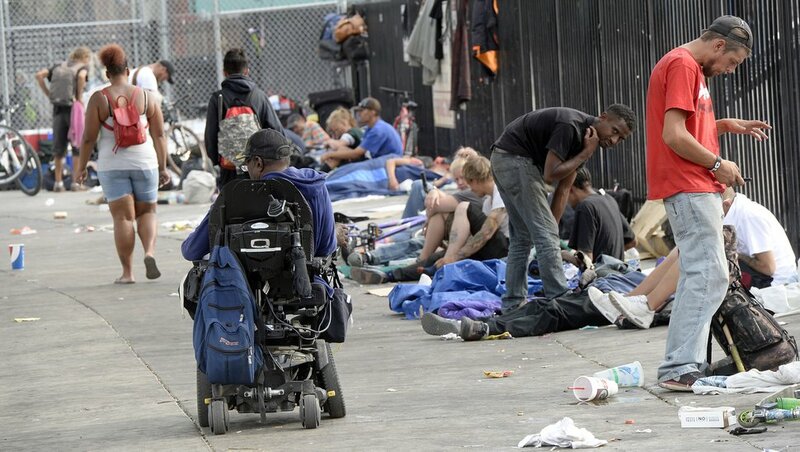 Sam Wolf talks to homeless people camped near 200 S. and 500 W. Wednesday morning July 19. He politely wakes up dozens of homeless camped on the sidewalks, telling them that they have to break down their camps and offers advice for help and rescources. Camping on the street is a class B misdemeanor and can now be enforced. Al Hartmann | The Salt Lake Tribune Salt Lake City police officer Sgt. Sam Wolf wakes a group of sleeping homeless people in makeshift shelter camped near 200 S. and 500 W. Wednesday morning July 19. He politely wakes up dozens of homeless camped on the sidewalks, telling them that they have to break down their camps and offers advice for help and rescources. Camping on the street is a class B misdemeanor and can now be enforced. Al Hartmann | The Salt Lake Tribune Salt Lake City police officer Sgt. Sam Wolf talks to people camped along 200 S. and 500 W. Wednesday morning July 19. He politely wakes up dozens of homeless camped on the sidewalks, telling them that they have to break down their camps and offers advice for help and rescources. Camping on the street is a class B misdemeanor and can now be enforced. 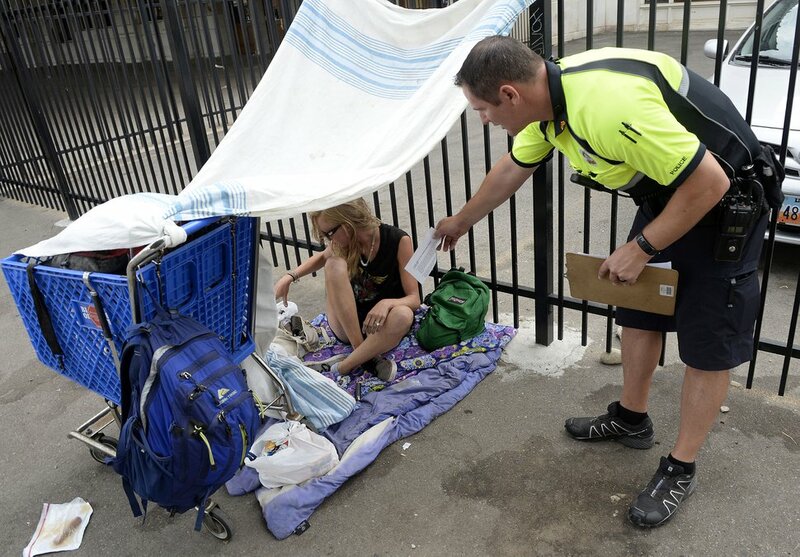 Al Hartmann | The Salt Lake Tribune Couple break down their makeshift shelter with belongings near 300 S. and 500 W. Wednesday morning July 19. Camping on the street is a class B misdemeanor and can now be enforced. Al Hartmann | The Salt Lake Tribune Scene along 500 West between 200 and 300 S. Wednesday July 19. Many homeless people sleep on sidewalk with their belongings and makeshift shelters. Camping on the street is a class B misdemeanor and can now be enforced. Al Hartmann | The Salt Lake Tribune Scene along 500 West between 200 and 300 S. Wednesday July 19. Many people sleep on sidewalk with their belongings and makeshift shelters. Camping on the street is a class B misdemeanor and can now be enforced. 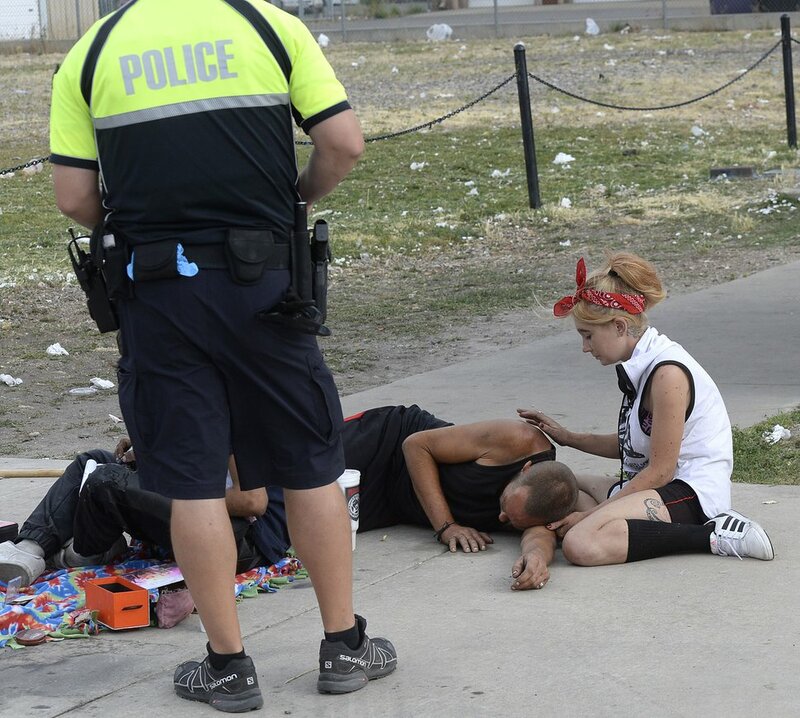 Al Hartmann | The Salt Lake Tribune Woman comforts man near a makeshift shelter along 300 S. and 500 W. Wednesday morning July 19. Camping on the street is a class B misdemeanor and can now be enforced. Al Hartmann | The Salt Lake Tribune Salt Lake City police officer Sgt. Sam Wolf walks to people in makeshift shelter with their belongings along 300 S. and 500 W. Wednesday morning July 19. He politely wakes up dozens of homeless camped on the sidewalks, telling them that they have to break down their camps and offers advice for help and rescources. Camping on the street is a class B misdemeanor and can now be enforced. 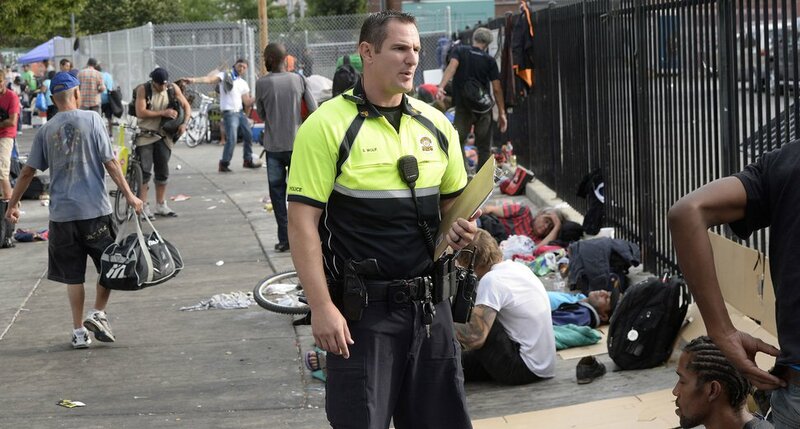 Al Hartmann | The Salt Lake Tribune Salt Lake City police officer Sgt. Sam Wolf talks to people near their makeshift shelter and belongings along 300 S. and 500 W. Wednesday morning July 19. He politely wakes up dozens of homeless camped on the sidewalks, telling them that they have to break down their camps and offers advice for help and rescources. 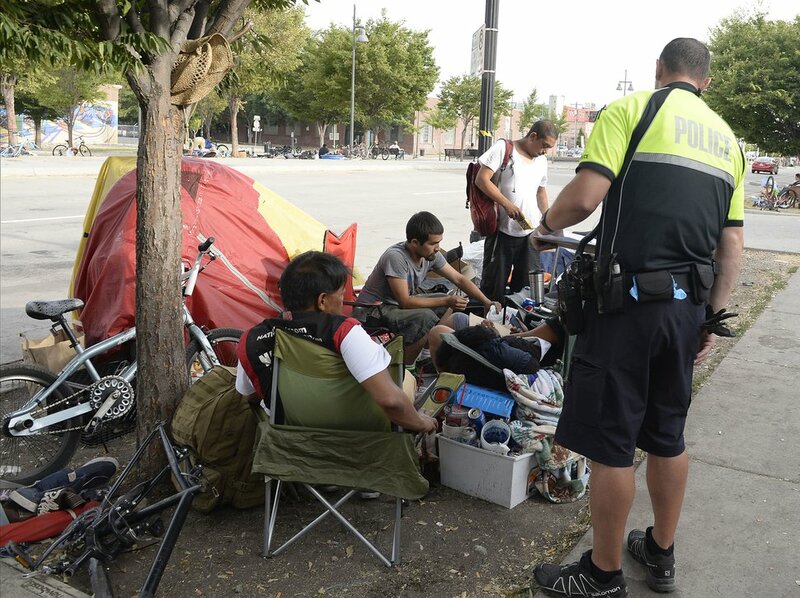 Camping on the street is a class B misdemeanor and can now be enforced. Al Hartmann | The Salt Lake Tribune Bicyle frames near 300 S. and 500 W. Wednesday morning July 19.